Jonathan Ashworth, Labour's Shadow Health Secretary speaking about the failed Coperforma contract in the House of Commons (photo from Parliament.tv). 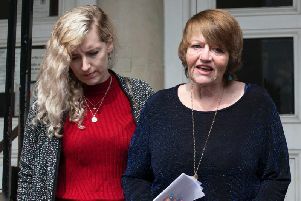 A Parliamentary inquiry into payments to a failed private patient transport service provider in Sussex should be held, according to MPs and trade union officials. Coperforma was awarded the contract by the county’s clinical commissioning groups (CCGs) in April 2016, but it never recovered from a disastrous start and after seven months later a ‘friendly divorce’ was announced. South Central Ambulance Service stepped in to take over the service providing transport for non-emergency patients and has run it ever since. But in Parliament on Wednesday (January 10), Hove’s MP Peter Kyle said it now transpires Coperforma was given more money from the NHS than it would received if it had performed properly for an entire year. In response Jonathan Ashworth, Labour’s shadow health secretary, joined calls for a full inquiry into how what he described an ‘absolute scandal’ had happened. The GMB union, which represents health and care workers, were the first to call for an inquiry. Gary Palmer, a GMB regional officer, said: “We are pleased Jon Ashworth has joined us in our call for an inquiry into the Coperforma debacle. It cannot be right that at least £14million was handed over to a private company despite them failing to fulfil the contract and it having to be brought back into the NHS within seven months. “Those responsible for this dire situation need to be held to account and lessons must be learnt to ensure this never happens again. “We continue to appreciate the support Peter Kyle MP has shown for people reliant on the patient transport in Sussex and for GMB members who continued to provide the patient transport service despite the incompetency of Coperforma and despite not being paid themselves for sometime. A statement from the seven Sussex CCGs said: “We have consistently recognised and acknowledged the issues experienced with the non-emergency patient transport service under the contract with Coperforma. “A number of independent reviews and reports were undertaken and published throughout 2016 and 2017 to identify the reasons for these and lessons learnt. “The seven Sussex CCGs have been taking legal advice in relation to these issues and we are currently looking at all the available options.